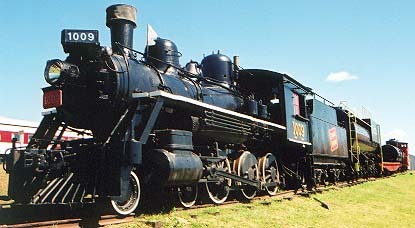 1009 was built by the Montreal Locomotive Works in 1912 as a contractor's engine, to a standard design. Built as O'Brien McDougall & O'Gorman #15, it was used in constructing portions of the National Transcontinental Railroad and other lines. Taken over by Canadian Government Railways as CGR 4529, it was renumbered later to Canadian National 1009. Locomotives of the F-1 class served many branch lines in the Maritimes, including the Hillsborough line, before the arrival of the larger G-16-A 1100 class. The last assignment for F-1-B and F-2-A engines was at Stellarton, N.S. In December 1955, CN 1009 was stored serviceable at Stellarton with 15,000 miles accumulated since back-shopping at Moncton. In 1957 it was renumbered to CN 1165 to make way for new diesels in the 1000 series. It ran a farewell trip out of Montreal in March 1958. Following removal from service it went to the C.R.H.A. Museum in Delson, Quebec. While at Delson it was renumbered back to 1009. Engine 1009 was brought to Hillsborough suspended over two flat cars and underwent restoration at the S & H shops. It is a powerful engine with 18" x 24" cylinders, 51" drivers, 160 p.s.i. boiler pressure and 20,735 lbs (21%) tractive effort. The weight of the engine alone is 44.5 tonnes (49 tons), while the tender weighs 14.5 tonnes (16 tons). With 18,200 litres (4,000 gallons) of water and 7.2 tonnes (8 tons) of coal, the total weight in working order is 89.1 tonnes (98 tons). It has Stephenson valve gear. 1009 leading our Fire Train display of 2001.